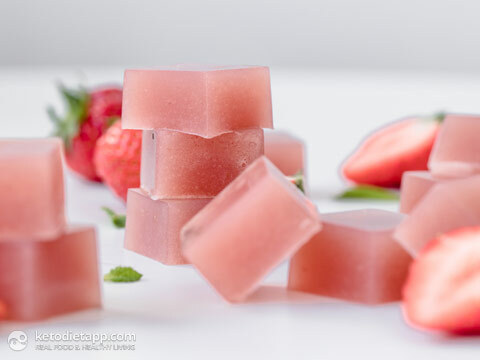 A great way to sneak more gut healing gelatin goodness into your life with these keto strawberry and lime jellies. Sweetener and sugar free and flavoured naturally with just fresh strawberries. 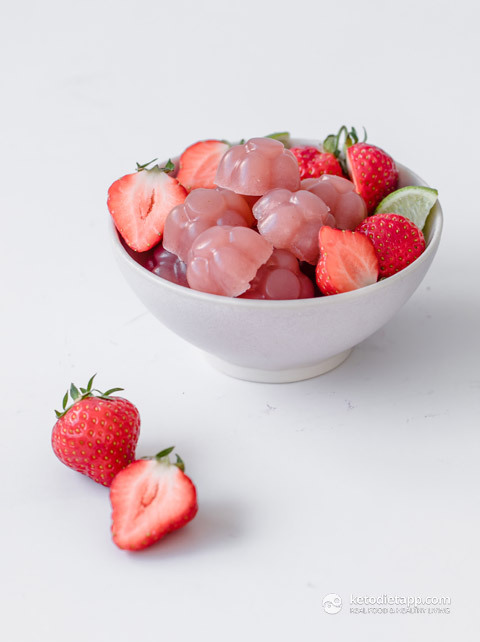 Gummies don’t come healthier than this keto recipe! 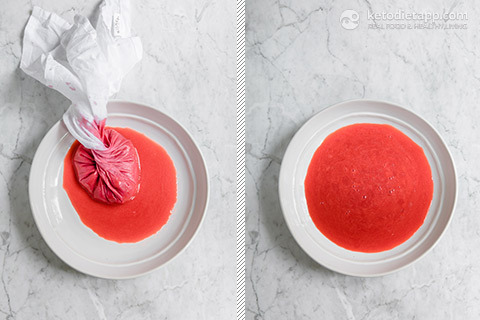 Place the gelatin into a bowl. Add the water and allow to bloom whilst you prepare the strawberries. 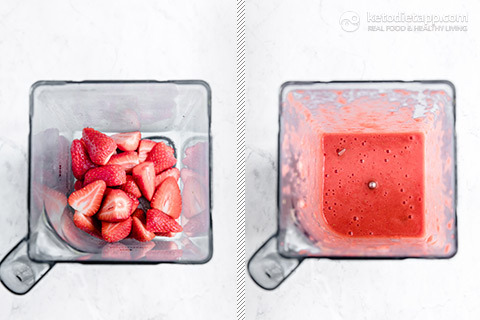 Blitz the strawberries in a high speed blender. Spoon into a muslin cloth and squeeze out the juice. Discard the pith. Place 1/2 the juice in a pan on a low heat to warm. Add the bloomed gelatin and whisk until combined. 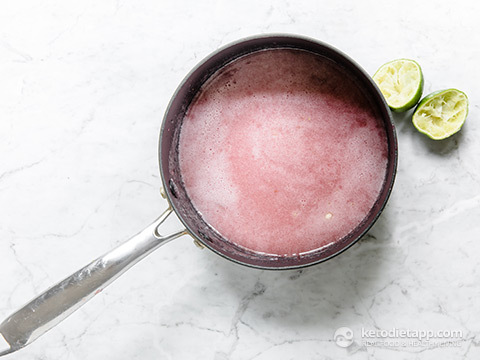 Turn off the heat and add the lime juice and the rest of the strained strawberry juice. Pour your strawberry mixture into a jug and then into the moulds. Place in the fridge for 3 hours to fully set. Store in a fridge for up to 2 weeks. Hi! I am enjoying all yr recipes. They are so good. Just a quick qn. 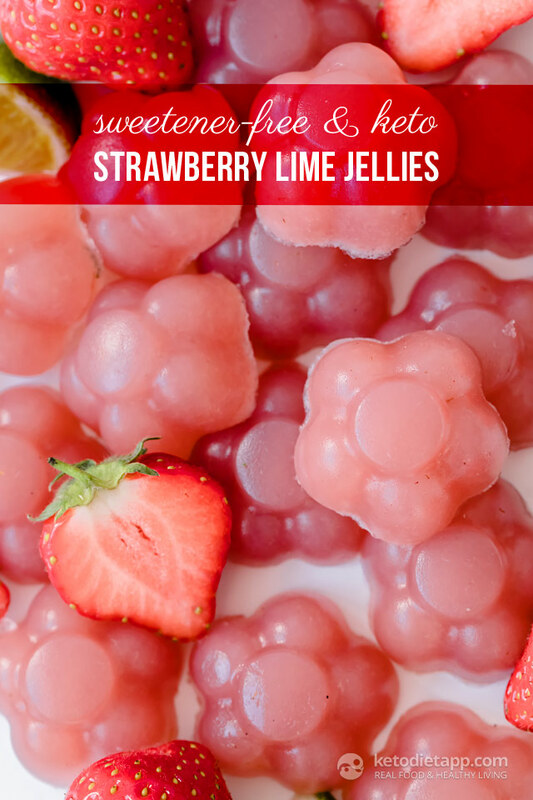 Could I use Gelatin Thickening Protein powder to make jellies? Hi Jules, can you give me an example (brand)? Thank you! Do you think a flavored sugar free gelatin can be used? I would personally avoid it. Sugar-free jelly is often made with artificial sweeteners and colouring. Where can I buy grass fed gelatin? 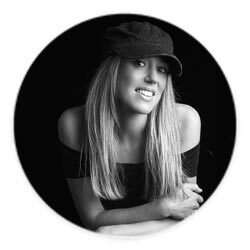 Do you have a brand you prefer? Hi Lisa, I like Great Lakes. This sounds delicious. Can you estimate how much total juice is used from the strawberries? I would like to experiment with other fruit. Thanks for the recipe. I have the same question. In step 3 it says to discard the pith, and step 4 it says to add strained strawberries. Did you mean to say to add the rest of the strained strawberry juice? I can't wait to make these today, I have everything I need right here. Thank you for all you do. These sound delicious. However, I am a little confused - in step 4 you mentioned adding the rest of the strained strawberries . . . . should that read ‘strained strawberry juice’? Hi Christina, it is indeed the strawberry juice (clarified in step 4). Thank you!